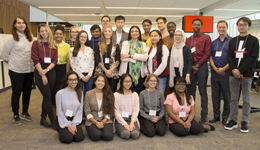 The Faculty of Liberal Arts and Professional Studies (LA&PS) 2018 Dean’s Award for Research Excellence (DARE) winners showcased their summer research projects at the DARE Poster Session on Sept. 20 in York University’s Second Student Centre. Attended by an audience of their peers, parents, faculty members and staff, the undergraduate student awardees delivered short research poster presentations on a range of topics, including: conjugal slavery in war, an ecological study of permafrost, financial inclusion and access to mainstream banking systems, human rights and surveillance, global employment standards and temporary foreign workers in Canada. LA&PS launched DARE in response to a call from undergraduate students who wanted increased opportunities to participate in research activities in the Faculty. The award provided students with $5,000 and the chance to engage in supervised research with faculty members over the summer term. The students’ reflections on their research experiences reveal the impressive depth and breadth of knowledge they learned this summer. DARE recipient and sociology student Zareef Ahmad was on hand at the celebration to discuss the project he worked on with human resource management Professor Kelly Pike, titled “Work and Gender Dynamics in the Global Garment Industry.” The project looks at women who work in the garment industry and how their lives are affected outside the workplace.